The Catskill Mountains Scenic Byway traverses a region that is often referred to as America’s first wilderness. Scholars trace the beginnings of the environmental conservation movement to this beautiful area that boasts mountain summits of up to 4,200 feet in elevation. The state-designated Catskill Park (the area within the “blue line” of many maps of the region) is not a “park” in the traditional sense. There are no entry gates or admission fees. It is instead a patchwork of public and private lands stretching over 700,000 acres, 40% of which is preserved as “forever wild” — the Catskill Forest Preserve. Another feature of the region is the 1600-square mile New York City Watershed. Six major reservoirs in the Catskills (two of them book-ending the Scenic Byway) provide 90% of New York City’s water supply. It is the largest unfiltered water supply in the U.S., providing more than a billion gallons of clean water each day to more than nine million people, nearly half the population of New York State. 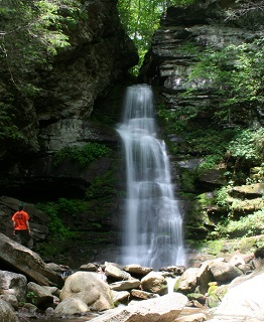 The NYS Department of Environmental Conservation is responsible for protecting state lands and operating state campgrounds in the Catskill Park. The New York City Department of Environmental Protection is the regulatory agency responsible for maintaining the reservoirs and water delivery tunnels. It also owns thousands of acres of land in its Watershed, much of which is open to non-motorized recreation. 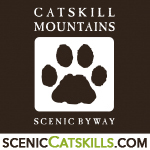 Several non-profit organizations also work in the Catskills, building and maintaining trails, repairing foot bridges, presenting programs, leading outings and serving as advocates for the Catskills environment. The Catskill Center, based in Arkville, which advocates for state resources in support of the Catskills, coordinates the Catskill Regional Invasive Species Partnership, holds conservation easements for the protection of open space, and owns two preserves for use by artists, educators and members of the public. The Center also maintains the Maurice Hinchey Catskill Interpretive Center in Mt. Tremper. 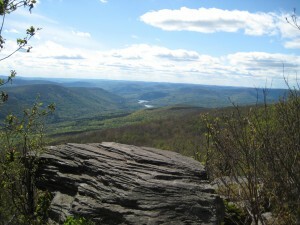 The Catskill Mountain Club, dedicated to providing non-motorized outdoor activities, including hiking, camping, canoeing, skiing and biking, to members, residents and visitors. The Catskill Forest Association, which advocates for and provides services to forest landowners, and provides educational programming for the public on a variety of forest-related topics.